The series of oxidation reduction reac: ons in which substances (glucose) are oxidized to carbon dioxide aad oxygen and energy is released is called respiration. Plants requre a constant supply of energy. This energy performs biological worK. The ATP provides this energy. All animals can generate ATP by breaking down organic nutrients. These nutrients are carbohydrates. fats, and proteins. The energy is released. This energy is used to join ADP and phosphate (Pi) to form ATP. 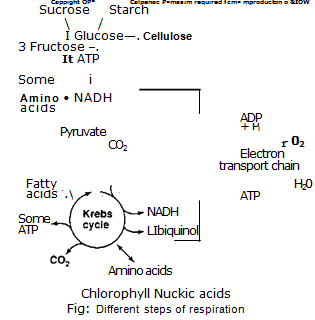 Aerobic respiration: It takes place in the presence of free oxygen. It includes Krebs cycle and electron transport chain. Anaerobic respiration: It takes place in the absence of free oxygen. This process is called fermentation. Glycolysis and fermentation (anaerobic processes) take place in the cytoplasm of a cell. But aerobic respiration takes place in the mitochondrion. I. The enzymes remained dissolved in the cytoplasm during eukaryotic cell evolution. These enzymes were not enclosed in membranous organelles. Therefore. glycolysis and fermentation occur in the cytoplasm. Thus the origin of glycolysis and fermentation took place before to the evolution of complex organelles. 2. Similarly these reactions occur in the earliest primitive environment of earth. This atmosphere did not contain free oxygen. So these reactions are also older than aerobic respiration.